Aircuity Architectural Series Wall Probe: This new wall probe is designed to be modern and aesthetically pleasing in commercial offices and other public gathering facilities. Aircuity (http://www.aircuity.com), the leading global provider of measurably better environments, is excited to announce several new products and additional features to its analytic platform. Based on two years of experience on its new cloud-based platform, these innovations are specifically targeted to the fast-growing commercial building health and wellness market. Aircuity recently completed delivery of its solution to two of the most iconic U.S. commercial office projects and is very active internationally in the same space thanks to its best-in-class life cycle cost and most accurate Indoor Environmental Quality (IEQ) sensing approach. MD100 Tubing: This is a plenum rated, more cost effective MicroDuct tube for multi-parameter sensing in healthy building applications. It allows for precise capture and measurement of volatile organic compounds and particles in addition to carbon dioxide and carbon monoxide levels, as required by a growing number of certifications like WELL. Architectural Series Wall Probe: This new wall probe is designed to be modern and aesthetically pleasing in commercial offices and other public gathering facilities. Increased number of sensed locations on each sensor suite: For healthy building applications, this allows for significant cost reductions, reducing first cost and increasing ROI. Aircuity creates smart airside solutions through its intelligent building platform, significantly reducing energy costs and improving the indoor environmental quality for occupants. As the leading demand control solution, Aircuity optimizes ventilation rates through its patented technology. As a result, commercial, institutional and lab building owners can lower operating costs, protect occupants and verifiably reduce energy use by as much as 60 percent. Founded in 2000 and headquartered in Newton, MA, Aircuity’s solutions have beneﬁted over 400 organizations such as Google, Amazon, Eli Lilly, Masdar City, the University of Pennsylvania, and the University of California-Irvine. 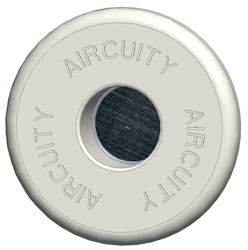 For additional information on the company and its solutions, please visit: http://www.aircuity.com.